You are here: Home / Blog / Hatched in the wild!! Our chickens lay one egg a day and when they want to hatch chicks (which is called “broody”). They want to accumulate at least 8 or 9 ; then they start sitting on them so they all hatch on the same day. We didn’t know she wanted to be “broody”; so we were collecting her eggs! She decided to take matters into her own feet, and hid her eggs outside in the tall grass. I had to hide and watch where she went to find where her eggs were! She was so well-camouflaged, it was hard to see her at all!!! Well, I was so afraid a predator would get her, I asked the “Backyard Chicken Forum” what to do! They recommended I try to move her at night. Well, I tried to do that. She would have none of it, and was flinging herself at the coop door in the morning and she went right back to where her eggs had been outside and squawked and squawked ; so I had to put them back where they were. I didn’t know how long she had been off her eggs; so I wasn’t sure they would hatch! This was ten days ago! I was worried every night, and checked her every morning , and yesterday morning I heard cheeping; and this brave little hen hatched eight chicks! I moved them into their beautiful own coop built and designed by Radisha! Happy and safe! This was right after they hatched! Count them! There are eight! 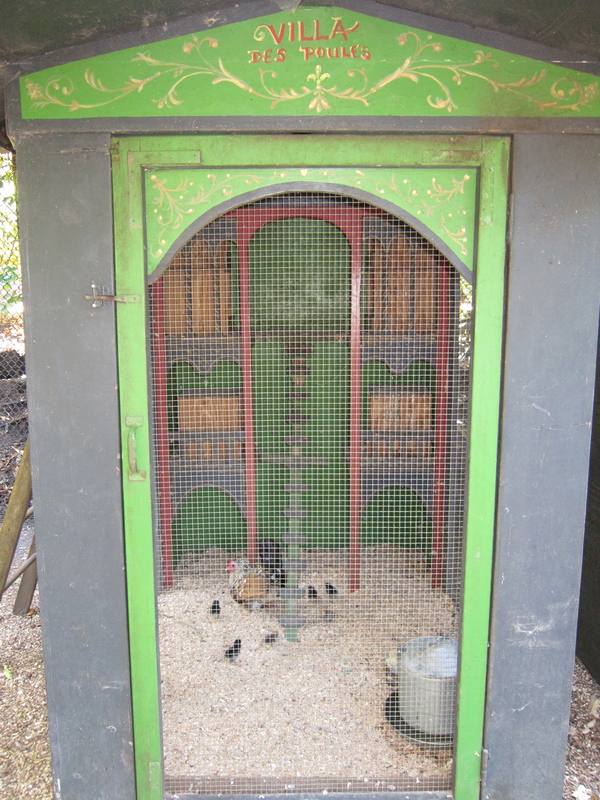 Her beautiful coop designed Balinese style and built by Radisha! A predator-proof coop inside of a predator-proof coop! Mommies with chicks like to be separate from the other chickens. I love happy endings!! Don’t you??? We have had 14 new chicks this summer! Previous Post: « Dive into Summer, my favorite pools! What a wonderful event to share. You’re right those chick are so cute and Mama is beautiful too. Have a great weekend! That hen is so smart! I’m so glad she was able to get her point across – what an adorable brood, and such a doting mother! Thank you for sharing Penny! 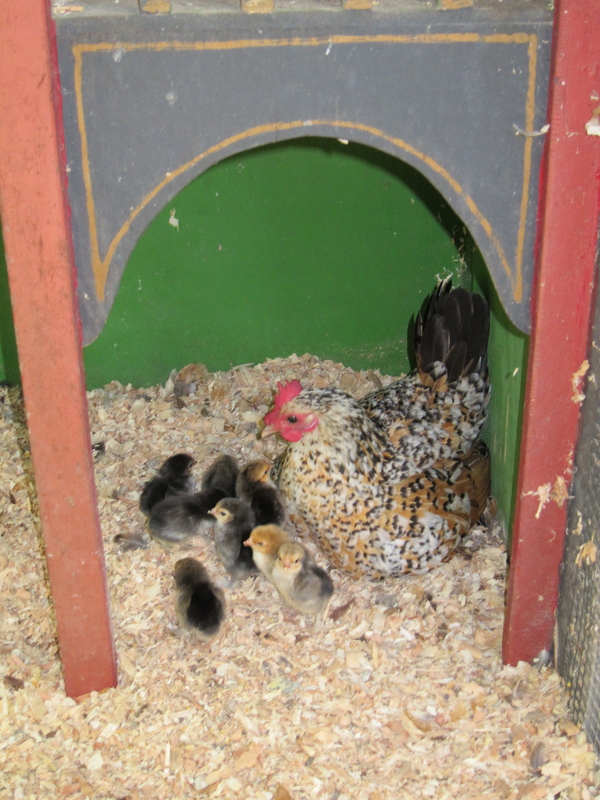 I love this story…the chicks are darling and what a clever momma! If you move will you live where you can take your chickens? Absolutely!! I even had them at our house in Pasadena!!! A real life fairy tale! Mother Nature & you! I agree, she is one brave and beautiful chicken! I love the color of the coops they look like India! Our chickens do become part of our families, don’t they? I worry about them all, as if they were my children, so I completely understand how you must have felt! I’m so glad your story had such a happy ending. Mom and her chicks are adorable and so lucky to have you. I just stumbled upon your lovely blog via Velvet and Linen. I’m a fellow Santa Barbara blogger and chicken lover. This is just the sweetest post! We only have 4 hens (no roosters) and unfortunately when we have been late getting them into the coop raccoons have gotten several. Your coop and chickens are beautiful. Buy some mealworms from grubco.com! just shake that sack….call: chick, chick, chicks! and they will come running! throw the worms toward that back of the coop! (it has to be predator proof or it is cruel to have them…. (.sorry) and then shut it! Don’t have chickens if you don;t care deeply about their safety! There is a lesson here! This makes me really sad. Call me. 805 969-1110 If you would like help! I have had chickens now for 26 years! 12 years in Pasadena…….14 in Montecito! I can help you!